Relatively weak interference on receive causes slight signal quality degradation compared to the remote side. In case the received interference is much stronger, radio may lose synchronization, even though Rx signal level seems to be sufficient. In both cases, person responsible for maintenance usually suspects radio hardware issues, which may result in unnecessary costly maintenance procedures (e.g. removing radio from the tower and sending it to repair). In turn, detecting interference is possible by properly analyzing radio receive signal parameters. Of course, onsite interference verification with portable spectrum analyzer like SAF Spectrum Compact ensures most reliable result. Main sign of the interference is significantly degraded MSE parameter (or other receive signal quality parameter), which usually significantly differs from the remote side. As a result, ACM engine (if enabled) shifts down modulation. In case the interfering signal is strong enough, increased Rx (RSSI) level may be observed. Majority of SAF Tehnika radios imply built-in Rx spectrum analyzer. It represents a spectrum curve of the received signal on the input of the modem. Normally it shows received signal curve from a remote radio and signal appearance will depend on configured bandwidth and signal strength. A measured spectrum curve can be used to recognize in-band interference or very powerful out-band interference (due to filters applied). In case of co-channel interference, spectrum graph may not indicate the interfering signal, as it just hides behind the main receive signal curve. Therefore it is usually recommended to perform spectrum analyzer test with the remote radio muted for several minutes. If local connection to the problematic unit is available. Mute remote radio transmitter for couple of minutes, then connect to the local radio and monitor Rx spectrum graph for several minutes. Since radio receiver is still tuned to the remote transmitter while remote transmitter is muted, it is possible to monitor any interfering signal received within the tuned bandwidth. If local connection to the problematic unit is not available. In this case muting the remote radio will lead to the loss of connectivity. Other method is setting minimal bandwidth and shifting the channel to the right and to the left for the half of used bandwidth from the original center frequency. Reducing bandwidth and shifting channel will partly free used spectrum from remote transmitter signal and will allow to check it for the presence of external interfering signals. Interference by the adjacent channel will occur if main signal bandwidth increases (left). Adjacent channel overlaps with main signal and creates co-channel interference (right). 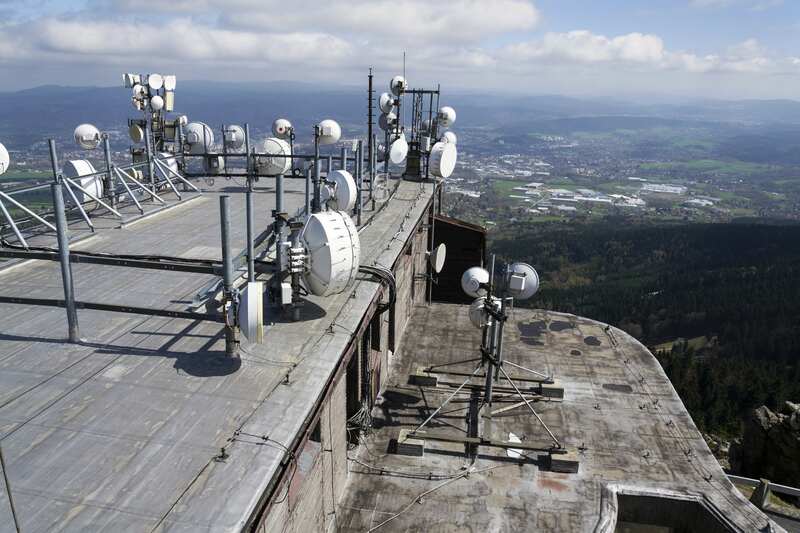 In case the microwave link works on the licensed frequency band, it must be checked whether correct frequency and bandwidth issued by the regulator authority are configured on the radios. If the appropriate channel is configured, interference presence must be immediately reported to the regulator authority. In case the microwave link operates on the unlicensed frequency band, radio link operator must deal with the problem by his own means. Fortunately, there are several instruments to perform prompt actions to deal with the faced interference issue. Change link operational frequency. Most often, when another microwave link starts operating on the same or adjacent frequency, and creates adjacent or co-channel interference. By selecting different operational frequency, the channel will be shifted away from the interferer. It is important to avoid hitting another already operating channel. High and low side software swap. In case receiver is suffering from interference in one sub-band, shift to the opposite sub-band may resolve issue if it is less congested in a particular geographical spot. Decrease bandwidth. In case the whole given unlicensed frequency spectrum is congested so it is very hard to find necessary free spectrum band for a channel, it is worth trying to reduce a bandwidth. As a result, less spectrum will be necessary and less probability to intersect with another neighbor channel. Change polarization of radios. In case the interfering signal comes from another microwave link working on a particular polarization, swap to another polarization will introduce approximately 30dB attenuation for interferer (Actual value depends on the specific antenna cross-polar discrimination). Move radio/antenna away from the source of interference. If installation premises allow moving radio away from the current spot (e.g. building roof), the receiver antenna may become less reachable for the interference signal and the main signal will be less distorted. If position of the interference source is known, it is worth using any available objects as shielding to block the interfering signal. Note, that antenna re-alignment may be required. Links operating on 24GHz spectrum may also suffer from interference created by the automotive proximity sensors and general purpose proximity sensors. Issues may be experienced if 24GHz radio is installed near the large parking lot, highway or cargo truck hub. Usually signal transmitted by such proximity sensors is strong enough to create a distortion in the receiver, which is installed within several tens of meters away. Even though antenna may be aligned in other direction from the interference source, signal from sensors may be still caught by antenna side lobes. Such interference usually degrades receive signal MSE as much as it is enough for ACM engine to shift down modulation for few levels. Per our experience, it is almost impossible do deal with such interference, hence moving the radio away from the interference source or change to another operational frequency (e.g. to 17GHz, if allowed by the local regulator) is required.